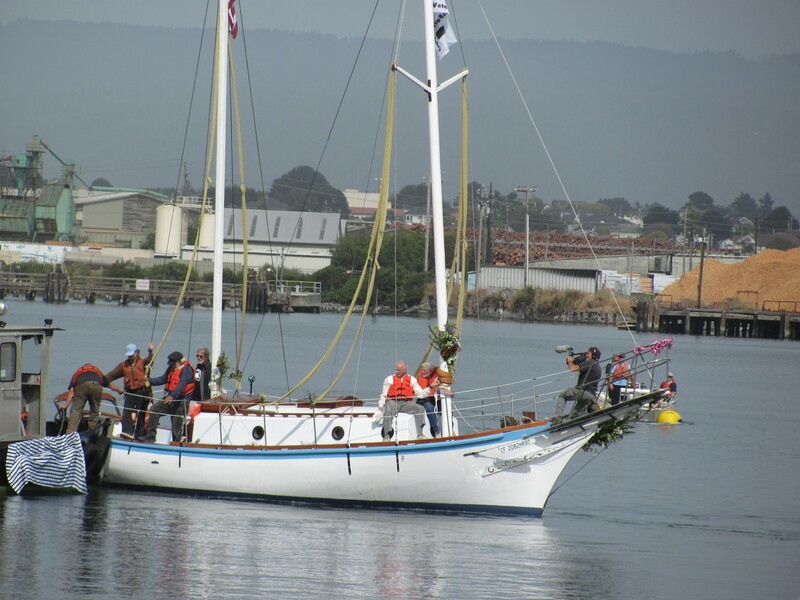 Greet and eat with the crew of the Golden Rule Anti-Nuclear Sailboat, a Veteran’s for Peace Project. 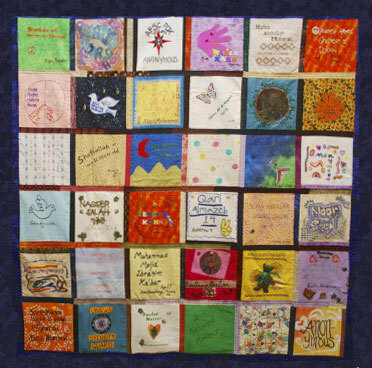 Potluck and talk at Monterey Peace and Justice Center (1364 Fremont Blvd, Seaside) on Sunday, September 13th at 2:00 pm. Bring your own plates, glasses, and silverware, for a waste-free event. Find out about the 10-year plan to sail for a nuclear-free world! Rides on the boat offered before the potluck and/or after – contact Gerry Condon at 206/499-1220. Andre Vltchek speaks about Western Imperialism’s crimes against humanity and what he has concluded from his travels worldwide investigating and documenting the exploited and the oppressed. His is a clear voice for a revolution of the downtrodden. 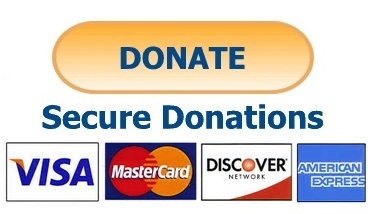 Sponsored by Women’s International League for Peace and Freedom and Monterey Peace and Justice Center. California Department of Corrections and Rehabilitation: Could it actually do what its name suggests? Sunday, June 7, 2:00 pm, California Department of Corrections and Rehabilitation: Could it actually do what its name suggests? Community Forum and Potluck hosted by the Civil Rights Coalition for Jail Reform – Monterey County and NAACP. 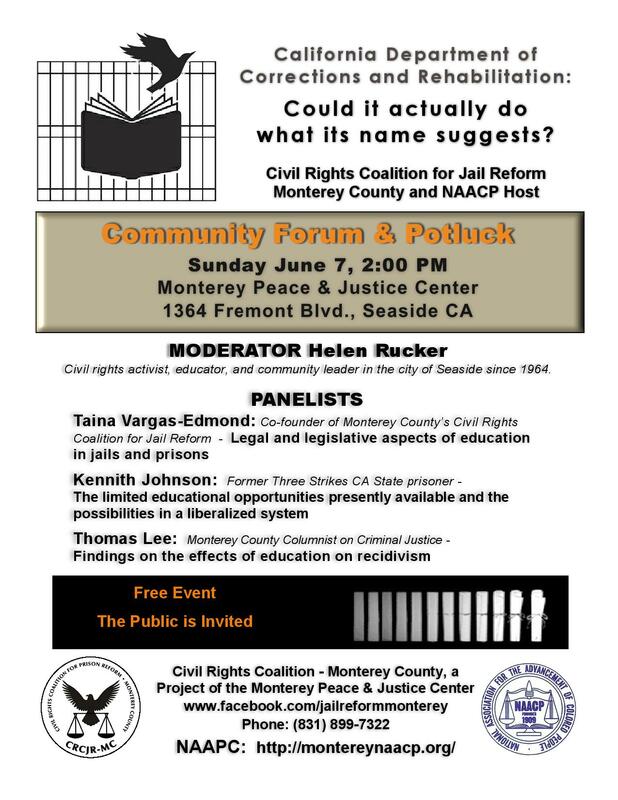 Moderator: Helen Rucker, civil rights activist, educator and community leader in the City of Seaside since 1964. Thomas Lee: Monterey County Columnist on Criminal Justice – Findings on the effects of education on recidivism. Free Event – the public is invited! 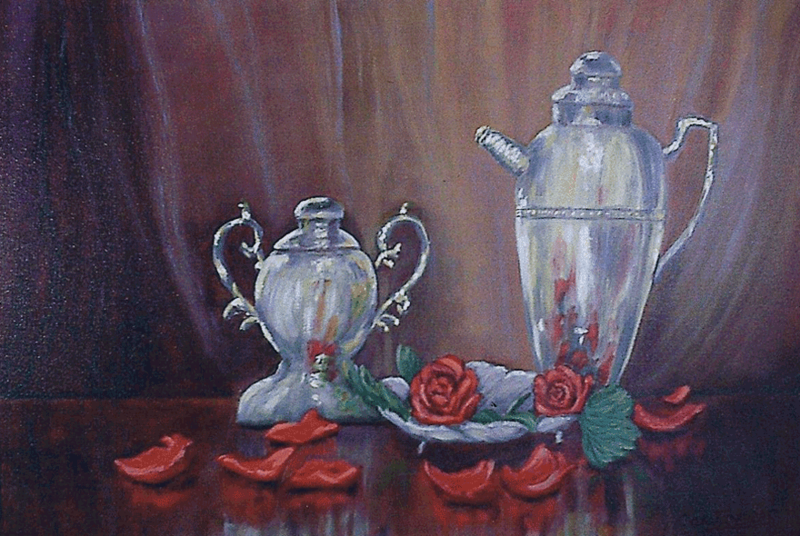 Saturday, June 6, 2:00 pm, Bold and Tender: Art Reception with oil paintings by Larry Contreras. Bold and Tender will hang in the MPJC gallery June 1 – July 31*. Painting brought extra pleasure to Larry’s life. It allowed him to step away from more mundane aspects of working for a living and taking care of responsibilities. He enjoyed painting scenes that involved very basic emotions, and brought pleasure to his eyes. Born in San Jose, CA in 1949, Larry was exposed to his mother’s oil painting. It was later in life that Larry took it up himself, receiving encouragement from the Joy of Painting PBS show, diving into how-to books, and painting, painting, painting! The results are amazing, with a great variety of subject matter! Bright colors, imaginative landscapes, and wild and not-so-wild animals in their natural habitat. You will find great composition, alongside a tenderness for the subjects. Come by and see for yourself! Larry left us in 2007, and his wife, Eva, will be joining us for the reception, sharing some of her beloved husband’s many paintings.